Photo Credit: Vermont Catholic/Cori Fugere Urban - Father Christopher Micale is pastor of St. Thomas Church in Underhill Center and St. Mary Church in Cambridge. Before Father Christophe Micale discerned his call to the priesthood, he was a lapsed Catholic, drifting to two Protestant churches as he looked for a deeper relationship with God. He had never abandoned his personal relationship with God, but he searched for God’s mission for him and found security in the boundaries set by the faith communities he joined. But he became more and more dissatisfied: Something was missing in the services he was attending, though they were prayerful and music-filled. He asked himself if there was more to going to church than hearing a good sermon and being with good people. “I came to know it was the Eucharist” that was missing from his church experience, said the pastor of St. Thomas Church in Underhill Center and St. Mary Church in Cambridge. And, he realized a devotion to the Blessed Mother was missing from those services. He was lead to read St. John Paul II’s “Ecclesia De Eucharistia,” which reinforced what he was missing. He learned to pray the rosary, a devotion he was not brought up with in his New Jersey Catholic family of parents and two brothers. “I realized I had to check out the Catholic Church again,” he said. Father Micale, who moved to Vermont in 1987, earned an associate’s degree in applied science in occupational therapy from New Hampshire Technical Community College in Claremont, New Hampshire, and a bachelor’s degree in political science/geography from the University of Delaware in Newark, Delaware. He holds a master’s degree in clinical psychology from the College of St. Joseph in Rutland and worked in various capacities, including at Dartmouth Hitchcock Medical Center and at Visiting Nurse Alliance of New Hampshire/Vermont as an occupational therapy assistant, and at Dartmouth College as an administrator of recruitment in the football office. After began attending Mass at Our Lady of the Snows he became a cantor. “When I make up my mind [to do something], I do it,” he said, referring to embracing his Catholic faith. While participating in other faith communities, people had sometimes told him he would be a good minister, but “it never went anywhere,” Father Micale said. He remembered those comments when someone asked him if he had ever considered the priesthood. He began to consider the priesthood and spoke about it with his pastor and with the vocations director for the Diocese of Burlington. 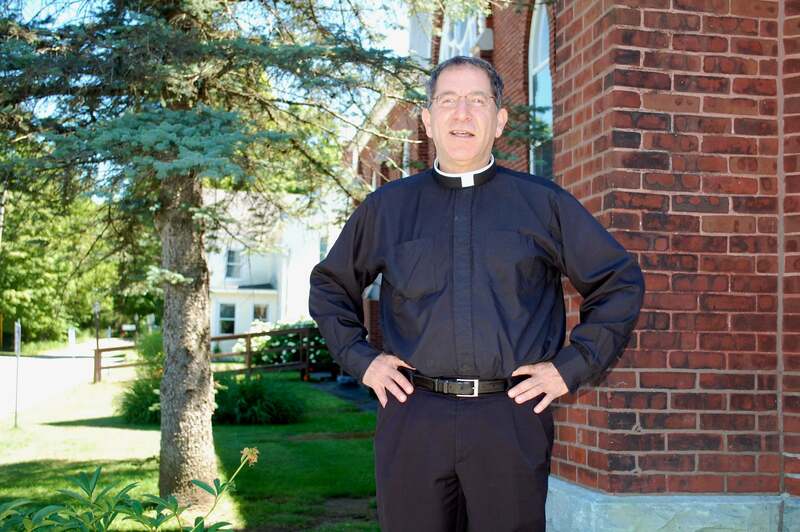 “It was an act of the grace on the part of God and [then-Burlington] Bishop [Salvatore] Matano” that he was accepted as a seminarian for the Diocese because he was older than most seminarians. Now 58, Father Micale said he was on the receiving end of some good-natured ribbing about his age while studying with younger seminarians at St. John’s Seminary in Brighton, Massachusetts. He was ordained in 2014.
that means simply shopping at the local store or attending a parade so he can be available and connect with people, showing his care and interest in the community. And now, as a priest, he is helping others to find for themselves that deeper relationship with God. —Originally publishes in the Fall 2018 issue of Vermont Catholic magazine.